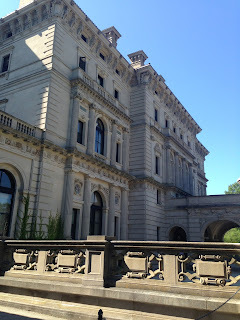 Before we went up to Maine for Elaine and Richard's wedding, we crossed an item off my bucket list, by visiting the "summer cottages" in Newport, Rhode Island (you'll remember we road-tripped out to Asheville, NC to see Biltmore a couple of years back, so we figured we might as well see the Vanderbilt's summer place). It was the perfect way to start a vacation. We pulled up to our charming B&B in the heart of town, and then walked down to the harbor to have our first — of many — lobster rolls of the trip. As we ate outside on a dockside patio, with late evening sun, it felt like another world. We've spent the last week on the East Coast, out here for my best friend Elaine's wedding. It's been a week to spend a lot of time thinking about community. On either side of the wedding, we got together with friends who previously we had only "known" on the internet. Beatrix made friends with their kids (she is now pestering for texting and email on her iPad so she can stay in contact), and we had a fantastic time with people we got to know deeper than online relationships can allow.